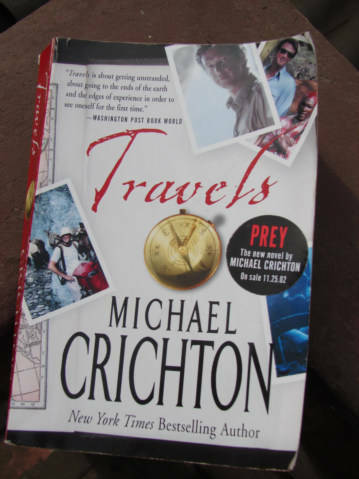 I finished this book by Michael Crichton called Travels. It is sort of relief to be finished. If I see a very tall, close to 7 foot tall man walking in the Hotel, I will have someone I can try to convince to clean the fan and change the light bulb. There is no way this guy would fit into a chicken bus in Guatemala. Autobiography, Auras, and Adventures, interesting collection of essays or ideas, gives me a better understanding of how he writes or creates his other books. I do not like to read travel books, and my natural desire to think as this as a travel book, interferes with my thoughts of the book, I would not call this a travel book. On the other hand, I have not read enough travel books to say what a travel book is, and hope I never become an expert on them. Michael is insightful, he can see the value of intuition, unexplainable experiences, and probably travel. I hope some publisher talked him into this and he did come up with the idea himself. Advice for Michael on travel, leave the girls at home, do not take a tour, fly to a strange country, get on a bus at 6:30 am in the morning going anywhere. About 2-4 hours into the ride start you intuitive engine. When it says get off, get off, however if you make a logical choice, stay on the bus, until you trust you instincts. It is ok to get off any time after 2:00 pm for safety reasons. The inner journey is done alone, where there is no path. I promise to make no jokes about being tall or hurting small Filipino girls, I think you could fly into Cameroon easy. I am quite sure Afrique is big enough for toi. By the way, when you get off a the bus, you are supposed to go look for a room for the night, that is what we do, it is an algorithmic process. Bring Shakira with you, it would be good for me.